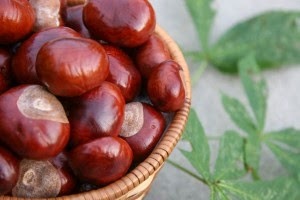 Are you a fan of chestnuts? I am! I love the roasted ones over the charcoal ones best! Chestnut puree is used in this recipe. It is so easy to make, it is just ridiculous! This recipe is from Maggie Beer, I have made some changes according to what I've got on hand. 1 - In a saucepan, add water and cream to chestnut puree and melt to combine on low heat. 2 - Add butter and continue stirring until it melts and combines, on low heat. Add Frangelico. 3 - Remove from heat and blitz mixture until smooth. Pour evenly into small cups and refrigerate until firm, around 20 minutes. 4 - Bring cream to boil, and pour onto chocolate. Stir to make ganache. Set aside. 5 - Pour chocolate ganache on the chestnut puree. 6 - Chill in the fridge until totally set.